Come learn a soft, flowing martial art form that builds strength, increases flexibility and enhances balance. This traditional martial art is an ancient form of Kung Fu that originated in China. Owing to its slow and graceful movements, Tai Chi is perfect for anyone of any age or physical condition. Unlike most exercise regimens that are outside the reach of individuals with physical limitation, Tai Chi offers a gentle approach that does not exert demands on the body. Tai Chi can also help lower blood pressure and produces a feeling of well-being similar to brisk walking or jogging. All the movements of Tai Chi are natural and rounded so there is no stress on the joints. Movements are performed after shifting weight fully from one foot to another to minimize impact on knee joints and avoid damage. Tai Chi, originally called Chinese Boxing, is both an incredibly beneficial exercise program and an effective martial art for self defense. Tyler Kung Fu & Fitness is currently offering Yang Empty Hand, Chen Style (cannon fist) Empty Hand and Traditional Yang Style Walking Stick Tai Chi Chu'an. 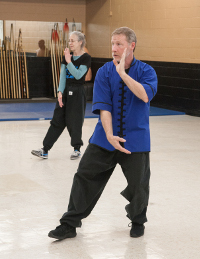 Each class teaches vigorous, beneficial warm up exercises and the various forms of Tai Chi step by step. Come see for yourself all the innumerable benefits this wonderful martial art has to offer!